Being a manager, who tells people what do, is something completely different then being a leader, who asks and listens ! Great business leaders foster an ‘inclusive’ environment in which everyone’s opinion counts, and in which everyone gets the possibility to learn. In many ways this resembles how parents raise their children, by respecting, coaching and stimulating them. And the good news is, this can spread like an infection through your organisation, in the end resulting in more satisfied customers and better business results! This is the main message of Lee Cockerell, in his new book Creating Magic. 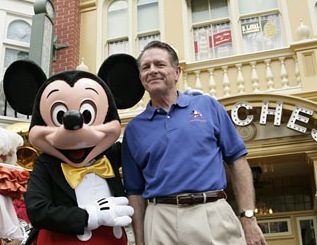 As executive vice-president, he was responsible for all operations at the World Disney World Resort during the period 1997-2006. What can we learn from Cockerell? A lot! Which manager doesn’t want to know how to create an environment in which everyone wishes to work, and which attracts customers in magical way? Lee Cockerell (see the picture below) received several awards for outstanding leadership. But above all, he is known for his creation of the Disney Great Leader Strategies. 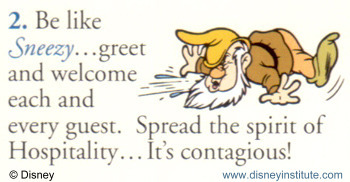 These guidelines still serve as the primary resource for developing all leaders at Disney. In addition, they form the core of the management training programs at the Disney Institute. The book is not only inspiring, it is also written with warmth. Cockerell sounds like someone you wished you had as a friend when you started your business. However, he admits that he has not always been this way. On the contrary, in the beginning of his carrier people saw him as a manager showing no mercy. Lee’s story is about a manager who changed his approach from ‘telling’ (do what I tell you or leave! ), to ‘asking’ (what do you need to do their job better’, and ‘listening’ (to problems people might have and to the voice of customers, who are not always fully satisfied). The reorganization of Disney from top-down to ‘democratric’, which was accompanied with the formulation of the Disney Leader Strategies, started in the early 90’s. There was a clear business-case for doing that: The switch was based on the finding that company parts with the highest ratings in customer satisfaction, were lead by managers that were rated highest in listening, coaching, and giving recognition and decision-making authority to their people. Cockerell: “I think this review was well done. I like the points made by Jaap van Ede about the relevance to Lean Management and Six Sigma. I believe that he is correct that the strategies and principles in my book relate very well to Six Sigma work. I often speak to Six Sigma groups. I will be attending a Six Sigma event in Orlando soon and am also speaking to a Six Sigma conference in Boston in October. My talks are about creating the right culture and environment so that maximum effectiveness of Six Sigma implementation can take place and stay in place. When everyone in an organization is committed to make an organization more efficient and effective then you have the right culture for achieving maximum business results." Cockerell starts his book with the following sentence: “I am grateful to the following people for their contributions to this book and to my life. Everyone Counts, and I want to know everyone that he or she counts”. Cockerell gives in his book 13 tips to create an inclusive environment. When a reader studies these well, he or she will almost certain find things to improve personally, not only as a manager but also in daily life. For me personally, ‘listen to understand’ was a real eye-opener. Like many other people I do not focus completely on the person I have a conversation with, but instead I am also busy formulating my reply or - as a journalist - thinking about what my next question will be. Walk ahead of the troops. Don’t stop learning, read and read even more. Visit the best companies in your business sector, and stay in contact with your colleagues.